While there are generic equivalents of many chemically based drugs that cost patients a fraction of the brand-name cost (thanks, I suppose, to the original drug patents expiring), this is not the case for the high-cost biologics -- like Enbrel, Humira and Remicade -- that many of us are turning to for relief. That high cost is raising the question of how long brand-name biologics can be exempt from market competition from "biosimilar" or "biogeneric" drugs -- especially in the U.S., where the high cost of drugs and cost containment are a crucial part of the health coverage debate. The Chicago Tribune has the story. I'm trying my best to step back a bit from the steady stream of news coming in about TNF-alpha blockers (i.e., biologics), because it can drown out everything else about our disease. But I have a selfish interest in the news that golimumab, which now has the trade name of Simponi, has been approved in Canada for the treatment of rheumatoid arthritis, psoriatic arthritis, and ankylosing spondylitis; it's apparently to be used in combination with methotrexate, and, like other biologics, it's indicated for AS when conventional (i.e., affordable) therapies have failed. Previously: Golimumab and ankylosing spondylitis. The Vancouver Sun reports that British Columbia's provincial prescription drug plan will cover adalimumab (Humira), etanercept (Enbrel) and infliximab (Remicade) for patients with ankylosing spondylitis who meet the criteria of the plan's Special Authority program. Update, March 8: Reaction from the Arthritis Society, which says that they and others have been lobbying the government for this decision for years. Amazing what a change of government does. Saskatchewan's provincial drug plan now covers Enbrel and Humira for ankylosing spondylitis under Exception Drug Status coverage. Update: CBC News coverage. Remicade wasn't approved because it costs more. Previously: More about Saskatchewan's TNF coverage; Saskatchewan to AS patients: No biologics for you! Fresh from going after Saskatchewan for its refusal to cover biologics for AS, Arthritis Consumer Experts is now turning its attention to the drug coverage provided to Aboriginal Canadians by the Non-Insured Health Benefits program of Health Canada's First Nations and Inuit Health Branch. Noted without comment -- I'm presently working on contract at Health Canada. A follow-up article from the Regina Leader-Post on Saskatchewan's coverage of biologics -- they're covered for rheumatoid arthritis, two out of three are for psoriatic arthritis, but none for ankylosing spondylitis -- suggests, as an aside, that the newly elected Saskatchewan Party government may reverse the earlier decision not to approve coverage for AS. Indeed: why should our disease be treated, pun intended, differently? Previously: Saskatchewan to AS patients: No biologics for you! Label enhancements for infliximab (Remicade) have been approved by the European Commission for ankylosing spondylitis, Crohn's, and psoriatic arthritis, according to a press release: "The ankylosing spondylitis (AS) label indication has been broadened to include adults with severe active AS who have responded inadequately to conventional therapy. The label also includes a significant improvement in physical function and quality of life." Pharmac, New Zealand's state pharmaceutical plan, covers TNF inhibitors for rheumatoid arthritis, but not for ankylosing spondylitis or psoriatic arthritis. On its face, this looks less like pushback against the high cost of TNF blockers and more like taking a long time to approve it for diseases other than rheumatoid arthritis (which is usually the first disease these things get approved for). It's not just Saskatchewan: Alberta's public drug insurance plan refuses to cover biologics for the treatment of ankylosing spondylitis, the Calgary Herald reports. The issue forming up is the need to keep skyrocketing drug expenses under control versus the need to provide effective treatments for crippling, chronic illnesses. (It occurs to me that if a $15,000-a-year treatment is the difference between someone working and not working, it's money well spent.) In a letter to the editor, Ken Mulholland argues, "I realize that these drugs are very expensive, but how is it that provinces like Ontario and Quebec have approved their use while Alberta, with all of its wealth, can flatly deny sufferers within its borders?" Saskatchewan to AS patients: No biologics for you! Meanwhile, a Canadian arthritis lobby group is fulminating against the Saskatchewan government, which last month decided against listing three TNF blockers -- presumably the big three, Enbrel, Humira and Remicade -- for the treatment of ankylosing spondylitis. This isn't about prescription drug coverage, says the group; it's about access, pure and simple: "As a result, people living in Saskatchewan with this inflammatory disease have absolutely no access to biologic medications to manage their disease." That seems a bit much. No access at all? Update, 11/15: CBC News has more, including the Saskatchewan Formulary Committee's rationale: their position is that "the clinical benefit does not justify the incremental cost of these drugs." As a result of last week's provincial election, there will shortly be a change of government in Saskatchewan, so this decision may well be reversed. Update, 11/18: More coverage from the province's main newspapers. Researchers from the RHAPSODY study, which is examining the efficacy of adalimumab (Humira) on ankylosing spondylitis, report that the incidence of uveitis is markedly reduced among patients receiving the anti-TNF treatment. NICE to AS patients: No Remicade for you! Britain's National Institute for Health and Clinical Excellence (NICE) has made a decision that restricts access to anti-TNF therapy by patients with severe ankylosing spondylitis, and the National Ankylosing Spondylitis Society (NASS) isn't happy about it. Only two out of three biologics will be accepted for use against ankylosing spondylitis: etanercept (Enbrel) and adalimumab (Humira), but not infliximab (Remicade). And Enbrel and Humira cannot be used sequentially -- which is to say that if you try Enbrel and it doesn't work, you can't then try Humira. And if neither works, you're SOL for Remicade. Cost is being cited: Remicade is more expensive to administer (since it can't be self-injected). See coverage from Channel 4, the Daily Mail, and This Is London. As anyone with chronic inflammatory arthritis will tell you, it's impossible to tell what treatment will work in advance: I'm on naproxen, but I know AS patients who can't tolerate it; I know people who use indomethacin, but couldn't handle it myself. To have only one shot at anti-TNF therapy may make sense from a cost perspective, but it's lousy from the perspective of the person actually suffering from the disease. Golimumab: another TNF-alpha antagonist for us to keep track of (I wonder what the trade name will be). According to a press release, "More than half of patients receiving monthly subcutaneous (SC) injections of golimumab (CNTO 148) 50 mg and 100 mg experienced significant and sustained improvements in the signs and symptoms of active ankylosing spondylitis, according to Phase 3 study results presented at the American College of Rheumatology (ACR) annual meeting." At some point there will be as many biologics at our disposal as there currently are NSAIDs. Not that they'll be as cheap. Of the new TNF-alpha antagonists -- principally etanercept (Enbrel), infliximab (Remicade) and adalimumab (Humira) -- that have generated so much attention in recent years and that have promised a revolution in the treatment of arthritic conditions, three things can be said. One, they're extremely expensive, costing thousands if not tens of thousands of dollars a year to administer. Two, they've been the subject of an intense marketing and media campaign on their behalf by the pharmaceutical companies, by doctors, and by advocates, who want as many people taking these new treatments and as many prescription drug plans covering them as possible. And three, from all accounts, they really do work. The cost makes me blench, and the marketing makes me nervous. But there's a rationale behind both, and that is that these treatments are unlike anything else that we've taken before. They are far more complex to manufacture than traditional drugs, and they cannot be taken orally -- the digestive system would destroy the proteins before they hit the bloodstream -- and so must be administered by infusion or injection. They are, in other words, qualitatively different from any other arthritis treatment out there, and considerable explanation is therefore required. There is therefore ample justification for a book such as Arthritis Without Pain: The Miracle of TNF Blockers, written by rheumatologist Scott J. Zashin with M. Laurette Hesser. While it suffers from the breathless "miracle-cure" rhetoric that I've seen before and that sets off my internal alarms, it does a respectable job of explaining what these treatments are, how they work, and how they fit in with other arthritis treatments out there. The detail is considerable, from how these treatments are administered, to how long they may take to take effect. And, to be sure, their potential side effects and drawbacks are mentioned as well. 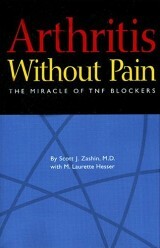 Arthritis Without Pain was first published in 2000; this is the revised 2004 edition. But events have already overtaken things somewhat: Enbrel and Humira have since been approved for ankylosing spondylitis, for example. And it's primarily a book for people with rheumatoid arthritis; those of us with other rheumatic conditions for which these treatments are (now) indicated may be a little disappointed with that focus. During a two-year clinical trial, the results of which were announced today, ankylosing spondylitis patients taking Remicade (infliximab) "experienced significant improvement in spinal mobility ... [and] showed sustained reductions in spinal inflammation through two years as detected by magnetic resonance imaging." The ASSERT (Ankylosing Spondylitis Study for the Evaluation of Recombinant Infliximab Therapy) trial involved 279 patients, 78 of whom received a placebo. I'm assuming this is a company-sponsored study. The first business is two requests from patients with a painful rheumatic disease, ankylosing spondylitis. They want drugs which cost £11,000 a year, but haven't yet been given the seal of approval by the health watchdog, the National Institute for Health and Clinical Excellence (NICE). Other local patients might be eligible -- so the question is: are these exceptional cases? "For a PCT our size, I guess we're looking at anywhere between 250 and 500 cases who may potentially benefit from this drug," said the public health director. Another panel member said: "The doctor who's presented this says the severity of this patient's symptoms is unusual -- but that's not the same as exceptional. "I guess for me it's the uncertainty about how this drug will affect this patient. Funding it would be a speculative move -- given the evidence we've got here." Both requests are turned down. It's worth noting that biologics are usually indicated when more conventional treatments are ineffective. The whole lot of us aren't going on Remicade, and many of us, I suspect in my limited and unqualified way, won't ever need to. Previously: Postcode lottery for TNF-alpha in the UK; AS and prescription drugs in Scotland. Biotech drugs are helping pharmaceutical companies' bottom line because, unlike simple pharmaceuticals, biotech isn't subject to expiring patents. Pharmaceutical companies can lose billions in income when a drug patent expires, though we benefit when a cheaper generic equivalent hits the market. So biotech's profit potential is much greater, because it is -- at least for now -- more or less perpetual. Why is this of interest? Because biotech includes TNF-alpha blockers like Enbrel, Humira and Remicade. (Humira is specifically mentioned in the article: it contributes $2 billion, or nearly 10 per cent, to Abbott's bottom line.) And these are the drugs that we, as ankylosing spondylitis patients, are increasingly being put on. We know we're being marketed to about these drugs. To what extent is these drugs' extreme profitability playing a role in getting us on them? It's hard to think objectively about these drugs in this context. They may well be better. But I can't help but wonder if the industry would prefer it if I (or my spouse's drug plan) was spending $1,500 on a biologic, rather than $30 a month on generic naproxen. The Salisbury Journal has another one of those articles about an ankylosing spondylitis patient who, having taken Remicade (infliximab), has made a dramatic turnaround: "After I had the treatment, I was out of the hospital like an athlete, I was told it could take several weeks to work but it was amazing and worked straight away," the article quotes the unfortunately named Mark Weakly. "It's like a miracle cure." As you may know, I've seen a lot of stories like these in the British press. An auto-injector for Enbrel (etanercept) is now available in Canada, which should make it easier for patients to administer their own meds. As someone averse to needles, I can appreciate this. British Columbia's provincial drug plan doesn't cover Remicade (infliximab) for ankylosing spondylitis, though it's been approved for rheumatoid arthritis and Crohn's disease, reports The Peace Arch News, leaving AS sufferers (or, presumably, their private plans) to pick up the full $24,000 tab if they want the newer treatment. One interesting bit from the article encapsulates the problem with B.C. 's prescription drug coverage: "B.C. pays more for generic drugs than other provinces; and, B.C. is usually last to approve new medications. One drug, Enbrel, for the treatment of psoriatic arthritis, has been under study and review here for more than three years. Meanwhile, it’s approved for use in every other province except Prince Edward Island." Of course, Enbrel (etanercept) is of interest to AS sufferers too. "Our observations strengthen our hypothesis that new bone formation in SpA is clinically relevant and largely independent of inflammation," Dr. Luyten states. "Long-term results from clinical trials are required to corroborate this hypothesis in patients with SpA," he acknowledges, "and to define whether the process of ankylosis should become a separate therapeutic target." Don't for a moment forget that when it comes to the biologic (aka TNF-alpha) treatments for ankylosing spondylitis, we are being marketed to: a total of $195 million was spent to market five biologics in the U.S., France and Germany -- direct-to-patient ads in the U.S. ("ask your doctor") only, doctor- and industry-targeted ads throughout. Keep that in mind when reading news coverage about this stuff, because frequently the boundary between PR and news is quite tenuous. Pharmaceutical company Amgen announced long-term results for Enbrel (etanercept): after three years, they report, 59 patients in their clinical trial "experienced sustained improvement in signs and symptoms, spinal mobility and physical function." Of that 59, 46 experienced at least 20 per cent improvement, and 18 achieved partial remission. Business Week; press release (reprinted here and here). It's interesting to see longer-term data on the new anti-TNF treatments, especially in the context of some anecdotal reports of them not working for people after a while. Pharmaceutical company Abbot announced today that Humira (adalimumab) has now been approved by Health Canada for the treatment of ankylosing spondylitis. It's already been approved for AS in the U.S. and Europe, and it's already been approved in Canada for rheumatoid arthritis and psoriatic arthritis. I think I'm beginning to understand the flurry of news stories from the UK that sound like adverts for TNF-alpha inhibitors (examples: 1, 2, 3). Rheumatology patients are encountering an unofficial "postcode lottery" -- i.e., a cap on the number of patients in a given locality who are able to receive the new treatments. Yes, they're expensive, but rationing seems cruel: either you have a national drug plan or you don't. Dr, Thomas Stuttaford, whom we last saw in a June 2005 writing a Times article about TNF-alpha inhibitors, is back in the Times with an article about ankylosing spondylitis -- and the effectiveness of the new TNF-alpha inhibitors in treating it. (I sense a trend.) Talks about the drugs' use and availability in the UK and mentions which pharaohs had AS, so it's a pretty broad-ranging article.